Dice come in a variety of shapes. Shapes of mathematically fair dice are called isohedra, which are convex polyhedra with special properties. 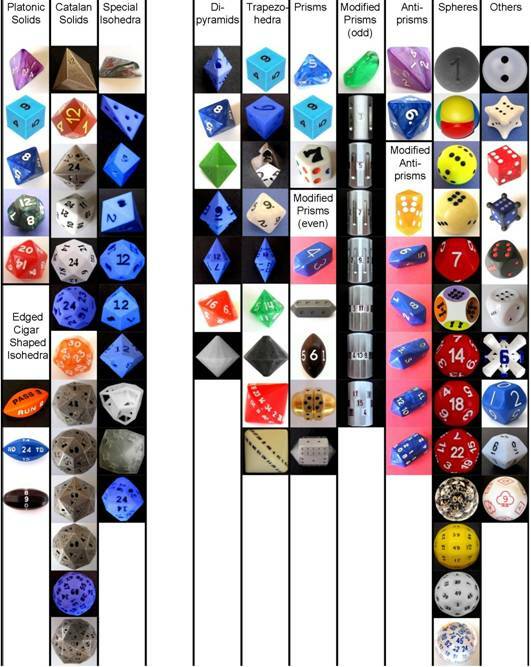 Other dice are based on barrels (prisms and antiprisms) and spheres. Platonic Solids: Convex polyhedra with equivalent faces composed of congruent convex regular polygons. Catalan Solids: Dual polyhedra of the Archimedean solids; their faces are not regular polygons. Dipyramids: Two pyramids symmetrically placed base-to-base. Trapezohedra: Dual polyhedra of the Archimedean antiprisms, composed symmetrically staggered congruent deltoids (or kites). Special Isohedra: Convex polyhedra with symmetries w.r.t an even number of faces, created by skewing platonic solids, catalan solids, dipyramids, and trapezohedra. We use the following definition of a fair die: A fair die is a shape that is labelled such that each label has an equal probability of coming up when the shape is tossed onto a flat surface, regardless of the materials used and the angle, spin and speed with which the shape is tossed. Commonly, only isohedra are considered to be shapes that make fair die. Here we also include shapes with curved surfaces, dice with instable surfaces, dice with an isohedral convex envelope and dice with movable parts (like spherical dice with an internal cavity and a weight) and dice in dice. Due to the importance of Isohedra, there is a special section with more details here. Triakis Tetrahedron (D12): A numbering scheme was suggested by Mitchel D Klink of the Bone Rollers’ Guild . When one side is face-down, the feature that actually points upward is an edge shared by two triangular faces, positioned so that the vertex at one end sits higher than the other. If the numbers on the faces are placed in one of the acute angles, the number that sits highest can be read as the result of its rolls. His design is now available on Shapeways. Tetragonal Scalenohedron (D8), a skewed dipyramid: The number to be read is that on the face which doesn't touch ground. For some special isohedra with up to, say, 12 faces it is possible to identify the rolled number on the face on top which is almost parallel to the ground, see e.g. the Deltoidal Dodecahedron (D12) below. There is no known numbering scheme that allows a clear identification of the rolled number for the Pentagonal Icositetrahedron (D24) and the Pentagonal Hexecontahedron (D60). Therefore, these isohedra are not suitable for dice. Platonic Solids are congruent are convex polyhedra with equivalent faces composed of congruent convex regular polygons. There are exactly five such solids: the cube (6 faces), dodecahedron (12), icosahedron (20), octahedron (8), and tetrahedron (4). Composed of four equivalent equilateral triangular faces with four vertices and six edges. One type of vertex with 3 edges. The tetrahedron is also a degenerate antiprism of 2 sides. No parallel faces. Therefore, either the edges or the vertices are marked with numbers. Composed of six square faces that meet each other at right angles with eight vertices and 12 edges. The cube is also a square prism. Composed of eight equivalent equilateral triangular faces with six vertices and 12 edges. One type of vertex with 4 edges. The octahedron of unit side length is the antiprism of three sides. The octahedron is also a square dipyramid with equal edge lengths. Composed of 12 regular pentagonal faces with 20 vertices and 30 edges. Composed of 20 equivalent equilateral triangular faces with 12 vertices and 30 edges. One type of vertex with 5 edges. Non-regular dodecahedron composed of 12 isosceles triangular faces with eight vertices and 18 edges. Can be constructed by cumulation of a unit edge-length tetrahedron by a pyramid with height sqrt(6)/15. Two types of vertices with 3 and 6 edges each. No parallel faces. A numbering scheme suggested by Mitchel D Klink allows that the number that sits highest can be read as the result. Dual polyhedron of the truncated tetrahedron. Composed of 12 rhombic faces with 14 vertices and 24 edges. Can be constructed by affixing a square pyramid of height 1/2 on each face of a unit edge-length cube. Two types of vertices with 3 and 4 edges each. Dual polyhedron of the cuboctahedron. Composed of 24 isosceles triangular faces with 14 vertices and 36 edges. Can be constructed by cumulation of a unit edge-length octahedron by a pyramid with height sqrt(3)-2/3*sqrt(6). Two types of vertices with 3 and 8 edges each. Dual polyhedron of the truncated cube. Can be constructed by cumulation of a unit cube by a pyramid with height 1/4. Two types of vertices with 4 and 6 edges each. Dual polyhedron of the truncated octahedron. Composed of 24 deltoidal faces with 26 vertices and 48 edges. Three types of vertices with 3, 4 and 4 edges each. Dual polyhedron of the small rhombicuboctahedron. Composed of 24 irregular pentagonal faces with 38 vertices and 60 edges. Comes in two enantiomorphous forms, known as laevo (left) and dextro (right). Dual polyhedron of the snub cube. No parallel faces, rolled number is not clearly identifiable à this shape is not suitable for dice. Composed of 30 rhombic faces with 32 vertices and 60 edges. Dual polyhedron of the icosidodecahedron. Composed of 48 triangular faces with 26 vertices and 72 edges. Three types of vertices with 4, 6 and 8 edges each. Dual polyhedron of the Archimedean great rhombicuboctahedron. Composed of 60 deltoidal faces with 62 vertices and 120 edges. Also called trapezoidal hexecontahedron or strombic hexecontahedron. Three types of vertices with 3, 4 and 5 edges each. Dual polyhedron of the small rhombicosidodecahedron. Composed of 60 irregular pentagonal faces with 92 vertices and 150 edges. Composed of 60 isosceles triangular faces with 32 vertices and 90 edges. Can be constructed by cumulation of a regular icosahedron by a pyramid. Two types of vertices with 3 and 10 edges each. Can be constructed by cumulation of a regular dodecahedron by a pentagonal pyramid. Two types of vertices with 5 and 6 edges each. Dual polyhedron of the truncated icosahedron. Composed of 120 irregular triangular faces with 62 vertices and 180 edges. Also known as the hexakis icosahedron. Three types of vertices with 4, 6 and 10 edges each. Dual polyhedron of the Archimedean great rhombicosidodecahedron. Dipyramids are also called bipyramids or basic triangular dihedral. An infinite number of solids can be created by placing two pyramids symmetrically base-to-base. The height is arbitrary. A dipyramid whose base is a regular n-sided polygon is composed of 2n identical isosceles triangular faces with n+2 vertices and 3n edges. The dipyramids are duals of the regular prisms. In order to end up with opposite pairs of faces for convenient numbering, there need to be an even number of faces on each side of the "equator", such that n has to be even (n=2m). Then, the total number of faces is 2n=4m, m>1. (If dipyramids with odd n>1 are chosen, the numbers have to be printed at the edges). n=3, base is a triangle, six faces, five vertices, and nine edges. Two tetrahedra placed symmetrically base-to-base. n=4, base is a square, eight faces, six vertices, and twelve edges. n=5, base is a regular pentagon, 10 faces, seven vertices, and 15 edges. n=6, base is a regular hexagon, 12 faces, eight vertices, and 18 edges. n=8, base is a regular octagon, 16 faces, 10 vertices, and 24 edges. n=18, base is a regular octadecagon, 36 faces, 20 vertices, and 54 edges. Trapezohedra (also called antidipyramids or deltohedra) are the dual polyhedra of the Archimedean antiprisms. (The name for these solids is not particular well chosen since their faces are not trapezoids but deltoids). The n-gonal trapezohedron (n>2) is composed of 2n faces which are congruent deltoids (or kites) with 2n+2 vertices and 4n edges. The faces are symmetrically staggered. The n-gon part of the name does not reference the faces here but arrangement of vertices around an axis of symmetry. In order to end up with opposite pairs of faces for convenient numbering, there need to be an odd number of faces on each side of the zig-zagged "equatorial" line, such that n has to be odd (n=2m-1). Then, the total number of faces is 2n=4m-2, m>1. (If trapezohedra with even n are chosen, the numbers have to be printed at the edges). There are two types of vertices, the ones on the “equatorial line” with 3 edges each and the two at the poles with n edges each. n=3, six faces, eight vertices, and 12 edges. A cube is a special case trigonal trapezohedron with square faces (top), and there is also a version with rhombi (bottom). It can be proven (friz) that there is no trigonal trapezohedron with deltoids. n=4, eight faces, ten vertices, and 16 edges. Numbers are printed on edges. n=5, ten faces, 12 vertices, and 20 edges. n=6, twelve faces, 14 vertices, and 24 edges. There are seven more solids which can be created by skewing platonic solids, and catalan solids, and three infinite classes of skewed dipyramids (2) and trapezohedra (1). They are convex with symmetries w.r.t an even number of faces. Composed of four identical isosceles triangular faces with four vertices and six edges. No parallel faces, but the number to be read is that on the visible face whose short edge lies on the ground. Composed of four identical scalene triangular faces with four vertices and six edges. Composed of 12 irregular pentagonal faces with 20 vertices and 30 edges. Skewed dodecahedron which has a symmetry that mirrors the octahedron. Composed of 12 identical deltoidal faces with 14 vertices and 24 edges. Skewed version of the rhombic dodecahedron. Composed of 24 scalene triangular faces with 14 vertices and 36 edges. Composed of 24 irregular tetragonal faces with 26 vertices and 48 edges. Can be constructed by warping the dodecahedron in such a way that each face folds in half. Can be constructed by squeezing the equatorial vertices of a dipyramid with 4n faces in and out from the center of the solid. Can be constructed by grasping a deltohedron by two opposing vertices and stretching it, to form an elongated solid whose sides are all of equal length, and then twisting it a bit, so the sides become uneven. The sphere is a solid with a single face. The lens is a solid with two faces. faces (not counting the sphere). This section shows dice with an isohedral convex envelope. They are fair. There are no parallel faces. This design consists of a wireframe with embedded parallel sides. Some basically unfair shapes can be turned into fair dice by modifying them in a way that the unfair faces become instable such that a die can land only on fair stable faces. Examples include “crystal dice” and barrel-type dice. An n-sided right prism is a polyhedron composed of two parallel copies of a regular n-sided polygon, connected by a band of 2n rectangles. The joining edges and faces are perpendicular to the base faces. An n-sided prism is composed of n+2 faces, 2n vertices and 3n edges. The dual of a right prism is a dipyramid. The only fair die that is a prism is the cube. The cube is an equilateral square prism. It is the only fair prism. However, prisms can be modified and hence turned into fair dice by making sure that they never land on its “poles” (the top or bottom face). This is typically done by putting two regular short n-pyramids (or some round shapes) on each of the base polygons. If these pyramids are short enough such that their faces are instable, we get a die which will always “land” on one of the n rectangles. Since these rectangles are all equal, this die can be considered fair. Because all isohedra have an even number of faces, these modified prisms are the only way to make “almost” fair dice with an odd number of faces. Rounded-off elongated right triangular prism. The die “lands” on each of the three faces with equal probability. Numbers are printed on or near the edges. Elongated right square prism with two square pyramids. Rounded-off elongated right hexagonal prism. The die “lands” on each of the six faces with equal probability. Elongated right heptagonal prism with two pyramids. The roll is the total of top three faces. Only every other face has a number. Elongated right decagonal prism with two “cones”. Elongated right Enneagonal prism with two pyramids. The die “lands” on each of the eleven rectangles with equal probability. alternating band of 2n isosceles triangles. The line connecting the base centers is perpendicular to the base planes. An n-sided antiprism is composed of n+2 faces, n vertices and 2n edges. Antiprisms are similar to prisms except the bases are twisted relative to each other, and that the side faces are triangles, rather than quadrilaterials: the vertices are symmetrically staggered. The duals of the antiprisms are the trapezohedra. The only fair dice that are antiprisms are the tetrahedron (a degenerate 2-antiprism) and the octrahedron (3-antiprism with equilateral triangles). However, antiprisms can be modified and hence turned into fair dice by making sure that they never land on their “poles” (the top or bottom face). This is typically done by putting two regular short n-pyramids (or some round shapes) on each of the base polygons. If these pyramids are short enough such that their faces are instable, we get a die which will always “land” on one of the 2n triangles. Since these triangles are all equal, this die can be considered fair. Right 4-Antiprism with two square pyramids. Right 5-Antiprism with two pentagonal pyramids. The die “lands” on each of the ten larger isosceles triangles with equal probability. The arrangement of the faces corresponds to an “elongated icosahedron”. Right 6-Antiprism with two hexagonal pyramids. Right 10-Antiprism with two decagonal pyramids. As seen above, n-sided prisms with n+2 faces do not make fair dice (except the cube) if no means are taken to make sure that they do not land on their “poles” (top or bottom surfaces). Still, there are some prism based dice being manufactured. Triangular right prism with numbers on the two base triangles and on the perpendicar edges. This die does not “land” on all faces with equel probabilities, i.e., it is not fair. Pentagonal right prism with numbers on the two base pentagons and on the perpendicar edges. This die does not “land” on all faces with equal probabilities, i.e., it is not fair. The longer the prism (compare to its „diameter“), the less likely it is that it lands on its poles. However, such dice can not be considered fair if that probability is not zero. The die “lands” on each of the five rectangles with equal probability. Numbers are printed on the edges. The die “lands” on each of the seven rectangles with equal probability. Numbers are printed on the edges. The die “lands” on each of the nine rectangles with equal probability. The die “lands” on each of the thirteen rectangles with equal probability. The die “lands” on each of the fifteen rectangles with equal probability. Some dice are made of spherical shapes. Here we show some mass produced spherical dice. There is a variety of designs available from Shapeways, shown in a special section with more details here. Spherical die with internal cavity (in theory an octahedron, the dual of the cube) in which a weight moves which causes the die to settle in one of six orientations when rolled. Zocchihedron is the trademark of the most common 100-sided die, which was invented by Lou Zocchi, and debuted in 1985. It is not a polyhedron. Rather, it is more like a ball with 100 flattened planes. It is not fair. Printed in White Strong & Flexible material. D6 was manually inked.